Play Dead by David Rosenfelt, a Mysterious Review. Review: "Golden retrievers do not belong in cages — ever — no exceptions." This statement opens the sixth legal thriller by David Rosenfelt featuring attorney Andy Carpenter, Play Dead. Andy is a dog lover, especially golden retrievers, and a partner on the Tara Foundation, a dog rescue operation. When Andy visits the foundation to check to see how things were going, he spots a seven year old golden retriever in a cage. The dog looks at Andy and his eyes tell him, "I do not belong here." Andy, of course, agrees. The dog was sentenced to be "put down" in less than ten days for biting his owner. Andy goes to court to appeal the dog's death sentence — and he wins. This is just the beginning of this absorbing and entertaining mystery. Five years ago, Richard Evans was accused and convicted of the murder of his fiancée, Stacy. They had been enjoying his boat when a sudden storm came up. The evidence showed Richard had killed Stacy, wrapped her up and threw her in the Atlantic Ocean. There was also evidence that Richard had been hit over the head and drugged, but this was presented as a suicide attempt. Also, Richard's beloved dog was missing. Did Richard throw Reggie overboard, too, in the black waters of the Atlantic, four miles from shore? Now, five years later, new and astounding evidence unearthed by Karen, Richard's loyal sister, that could overturn the verdict of the murder and free Richard from life imprisonment. Karen takes the evidence she has acquired, which is not much according to the law, to Andy and pleads with him to to defend Richard should a new trial be granted. The new trial brings about the facts that this is not just about the murder of a young woman. The evidence takes on some intriguing plots, schemes and secrets. These charades involve the New Jersey Port Authority (where Richard worked before he was arrested), U. S. soldiers who were a team in Afghanistan with Richard, members of the mob, and certain departments of the U. S. Government. Andy and Karen are both targets for a gunman, and both have been shot at. But no one knows who is trying to kill them or why. David Rosenfelt is a very clever and witty writer. He begins by saying he doesn't particularly like acknowledgment pages, but feels that maybe he should acknowledge a few who have helped to inspire him along the way. Here's a sample: Michael Jordan, Joe Montana, the whole state of Montana, … these are just a few of the seventy-five that Rosenfelt acknowledges. Reading something like this gives the reader a feeling of ease and a promise that the story will be interesting, entertaining and likable. Andy and his circle of co-workers and friends are very believable. With the multiple and intersecting storylines, the plot gets a little confusing at times but all it comes together in the end. It is a fast-paced and very readable book. Special thanks to guest reviewer Betty of The Betz Review for contributing her review of Play Dead. 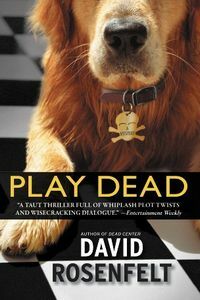 Acknowledgment: Hachette Book Group provided a copy of Play Dead for this review.